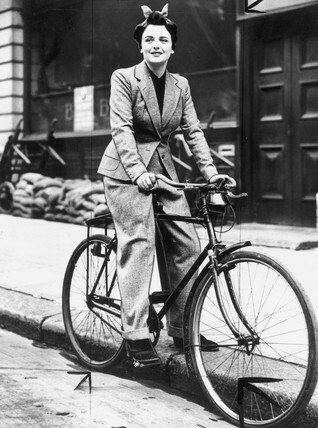 Young woman on a bicycle, wearing a trouser suit, 27 October 1939. ‘Three-piece suit for wartime cycling girl. With the immense increase in the popularity of cycling owing to petrol rationing, dressmakers and tailors are setting out to make suitable clothes for it. Aquascutum of London have produced a three-piece man-made tailored suit in Scutum cloth which is rainproof and windproof. The three-piece consists of a coat, a skirt with three inverted pleats in front, and a pair of trousers zipped at the sides. A girl can thus ride to work, or elsewhere, in trousers and then change into a skirt.